Height: 6-6 Weight: 210 lbs. Glenn Robinson III is what I like to call a rather combo prospect. This guy possesses the traits needed to succeed in this league. Like his father, former NBA player Glenn Robinson, Glenn Robinson III is a reliable scorer, phenomenal team player, and can defend the perimeter at ease. Robinson III is the ultimate team player; he doesn’t gamble in passing lanes, plays the game with class, proven he can take over games in his freshman year being the number 3 scoring option, versatile small forward who can spread the floor, makes accurate outlet passes for his position, and brings an aggressive play style to his team. 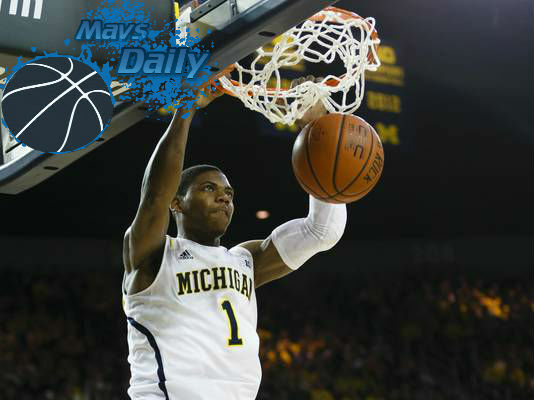 With a stacked team in Mitch McGary, Tim Hardaway Jr., and Trey Burke, Michigan was a stacked bunch in Robinson III’s tenure with the Wolverines. That also led to him playing a bit too unselfish. Also, playing on a team where you are the 3rd scoring option for the bunch could also lead to inefficiency. His inefficiency showed time after time at Michigan, but transferring to the NBA, Robinson III can show his abilities and make a name for himself if he indeed gets drafted in Dallas. With an unpredictable starting rotation, coach Carlisle would give the rookie a chance. Robinson III would fit in quite well with Coach Carlisle’s 2-3 zone-as he was successful in the Michigan Wolverine’s effective team defense in the 2013 NCAA tournament. Robinson III’s athletic abilities should not go unnoticed either with a 6-10 wing span. Plus, with an acknowledgement of what an actual NBA player possesses in his dad, Robinson III has untamed potential to be a successful starter in this league one day. But however, with an undersized frame, you just know prospect scouts will write him off in a heartbeat. With a possibility of Robinson III falling to the Mavericks around pick 20, there’s no reason the front office should consider him. Height: 5’11” Weight: 178 lbs. Phil Pressey is one of my favorite prospects in this year’s or next year’s draft. The Mavs could use scoring and a hustler off the bench. Rodrigue Beaubois is inconsistent, Brandan Wright needs a reliable pick & roll buddy, and overall, it’s time to collect some prospects for the future. The potential in Pressey might be a concern with his size, but in the past few years, the point guard position has evolved into the greatest position of this generation. Pressey has all the fundamentals and attributes to develop into a reliable dimer and floor general off the bench. Size doesn’t prove anything.